Sunday May 15th 1881 I helped do up the work and Rob and I went to church. We went down to Hatts for our dinner and Rob came over home for the phaeton to bring us home. I saw Mary Donovan. She cant come to sew till the last of the week. 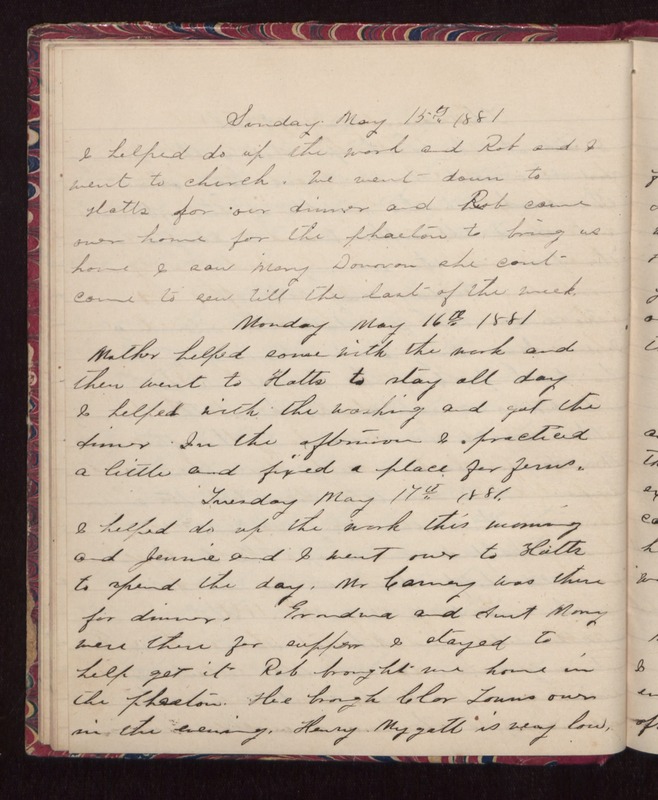 Monday May 16th 1881 Mother helped some with the work and then went to Hatts to stay all day. I helped with the washing and got the dinner. In the afternoon I practiced a little and fixed a place for ferns. Tuesday May 17th 1881. I helped do up the work this morning and Jennie and I went over to Hatts to spend the day. Mr Carney was there for dinner. Grandma and Aunt Mary were there for supper. I stayed to help get it. Rob brought me home in the phaeton. He brought Clar Towns over in the evening. Henry Mygatt is very low.